Mouse is one of the useful electronic component with which we interact with a Computer. The Computer in question can be a desktop or a laptop or even some embedded computer in a machine. Touch Screens are also a quick way to simulate mouse movements and clicks. With descreasing prices of display devices such as LCD screens , LED Screens , the CRT Monitors are becoming obsolete and the costs of a touch screen monitor still remains on a higher end. Touch Screens do simulate mouse clicks as and when the touch screen is pressed with a finger or some other pointing device. In case you are looking for a custom software solution that can be helpful to you, you can write to software@jholu.com and we can develop a custom made software for you. As Mouse plays so much important role in using a Windows or any other computer, this post describes what settings are available from the control panel so as to configure or change mouse settings or even to debug and find out what might be the issue with your mouse. A Mouse can be connected to a computer using a USB port or a Serial port. In case you do connect dual or multiple mouse to your windows computer, all will work in synch. Or in other words there will be still one mouse cursor on the screen and all the mouse connected can be used to control the same mouse cursor. In Windows 7 or in Windows 8, there are good chances that you might not need to install mouse driver or any other extra software to connect multiple mouse to a single computer. However in Windows XP, you might be required to install corresponding driver depending on the make and model of the mouse you wish to connect to your windows computer. In case you do wish to connect a gamer mouse or a programmable mouse to your computer, some extra software or driver might be required to be installed on almost all versions of Windows including Windows Vista, XP, Windows 7, or even on Windows 8. Just make sure that you do not loose the CD or DVD that comes with the gamer or programmable mouse. 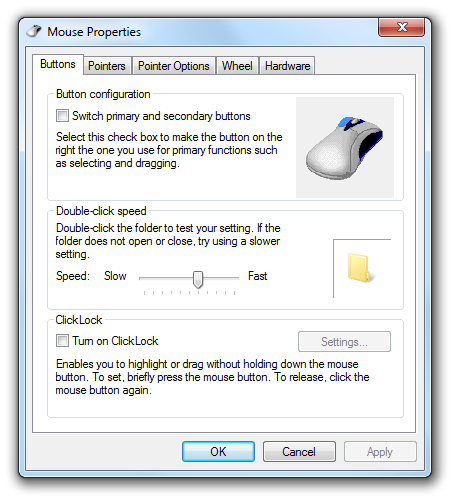 As for other normal mouse with two buttons and a mouse wheel, just connect the mouse to your windows computer and corresponding driver of the mouse should be there in your windows Windows Vista, Windows 7 and Windows 8 computers. In case you would like to know and understand what options are available to control or configure your connected mouse, do open up control panel and click on the option that reads Mouse. This will open up Mouse Settings which is a multiple pages screen to control and configure the options available for your mouse cursor. Remember irrespective of how many mouse you connect to your windows computer, only one mouse pointer will be visible and you will be able to control it using the control panel’s mouse settings as displayed below. The very first page of Mouse Properties Screen allows to view and configure options available to control mouse Buttons. The Button Configuration section provides a quick and easy way to Switch primary and secondary buttons of the mouse connected to the windows computer. By default the checkbox to switch mouse buttons will be unchecked and once you check it, your mouse will start simulating mouse clicks whenever you press the right button on the mouse. This is just swapping of mouse buttons and will be indicated in the mouse figure to the right of the Button Configuration section. Once you check or uncheck the checkbox to switch mouse buttons, you would need to click on OK so that the changed mouse button actions are applicable. In case you do not want to switch or change the mouse button settings, just click on cancel to discard the changes done. You can also press the Esc button while the Mouse Properties Screen is active to discard the changes done and close this Mouse Settings controller screen. The next section below the Button configuration allows to control the Double Click Speed of the Mouse Buttons. There is a slider which controls the speed of the double click of mouse. In case you do make changes to the Double-click speed of mouse buttons, do test it by double clicking on the folder image next to the slider controlling the double-click speed of the mouse buttons. The Next tab in the Mouse Properties control panel option allows you to control options available to configure mouse pointers and allows you to select which theme of mouse pointers you wish to be active. All other options of the Mouse properties are simple and easy to configure with the rule remaining the same and that is, once you do any changes to the mouse configuration, do not forget to click on OK at the bottom of the Screen. The OK button of the Mouse Properties Screen applies and stores the changes to the Mouse Configurations and closes the screen, whereas the Apply Button will become enabled only when you have made any changes to the Mouse Configuration option and can be used when you want the changes done to be applied and saved but you do not want the Mouse properties Screen to Close.